Or Get Quote NOW ! Cargo ready for Ship - Date? We offers low price Car shipping by shared container from USA to UK from only £650.00 Per car | Importing a Classic car from the USA to UK | Container shipping method offers a very secure and safe way of shipping vehicles from USA. We can advise how to Importing American Classic Cars step by step just call us today. Shipping Car from Houston to UK Port to Port - Per Car £650 Book your space Now! Shipping Car From New York To UK Port to Port - Per Car £650 Book your space Now! Shipping Car From Los Angeles to UK Port to Port - Per Car £795 Book your space Now! Shipping Car From Miami to UK Port to Port - Per Car £850 Book your space Now! Shipping Car from Savannah to UK Port to Port - Per Car £650 Book your space Now! If you need any further information please contact our specialist for the USA Import Trade Tel: 01473375030 Option 3 or 07876 343952 Or Email jason@seakargo.com . Vehicles are packed and secured professionally using wheel chocks, straps to the container floor or ramp to ensure safety whilst in transit. With a network of warehouses USA, UK and the world you can be sure that your vehicle is loading and unloading with care. we handle running and non running vehicles on daily a basis. Our vehicle containers are unpacked at our Ipswich warehouse (Seakargo own warehouse) fully equipped to unload vehicles from containers. Vehicles can be delivered into any of our United States warehouses, we offer vehicle collections covering the whole of the united states. 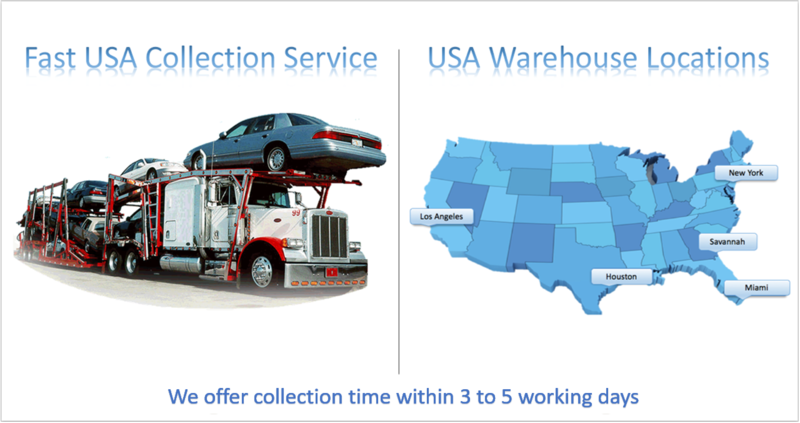 Now with our own staff in the USA we can offer faster domestic vehicle collection service. WE OFFER SHARED AND DEDICATED CONTAINER SERVICES FROM: USA Warehouse Locations Los Angeles, Houston, Miami, Savannah, New York. We are also able to meet UK legislation requirements to all HD trucks with no down-plating. Typical vehicles may include Ford F250, F350, F450 and F550. Dodge 2500 and 3500, Silverado 3500. Please call Jason or Johnny on 01473 375030 for more information. We also arrange the importation of custom bikes, trikes and quad bikes and then complete the full mechanics, legalisation and registration to UK/EU conformity. In order to ship a car from the USA to Ireland or Northern Ireland, you will first need to determine whether you are permitted to ship the vehicle in the first place. Only cars originally registered in the EU that are now being shipped to the UK qualify for mutual recognition. It is crucial to know when your car is eligible for mutual recognition, as this can save a lot of time and effort in determining whether the vehicle conforms to UK roadways. visit this linkFor more information, It is a good idea to either contact the DVLA in Great Britain or the DVA if you would like to import a vehicle that is more than 10 years old, to ensure all requirements have been met in order to obtain permission. In the following scenarios, you will be subject to VAT and vehicle tax. Your vehicle is relatively new and has been driven for less than 6 months. You normally live outside the EU and plan to remain in the UK for more than 12 months. You previously got a refund on VAT or sales tax on the vehicle. You bought the vehicle duty free or tax free. You live in the EU and are only importing the vehicle temporarily. You are relocating to the UK and are eligible for residency transfer. You are not from the EU and are importing the vehicle to use temporarily. You must be visiting the UK. You must only be using the car for a period of 6 months. The vehicle must be registered and taxed in its home country. If you are a student or employee who is not living in the UK, you qualify for a period that’s a bit longer. Do contact the HMRC in advance and get hold of the official documentation for proof of customs relief. Any vehicle over 30 years of age, that meets the criteria to be imported under the historical VAT rate will attract 5% VAT and 0% Duty.